The exchange rate is a widely discussed topic at present. There is much debate on whether the exchange rate should appreciate or depreciate due to its impact on economic activity. Although there are pros and cons of depreciation of the exchange rate, the popular sentiment is against the depreciation of the exchange rate. Opponents of depreciation highlight that any depreciation of the Sri Lankan rupee will increase the value of the country’s stock of foreign debt in terms of Sri Lankan rupees while increasing the domestic price of imported goods and services. However, in order to assess the economic impact of an exchange rate depreciation, it is necessary to have a clear understanding of the exchange rate, its determinants and movements. Therefore, the objective of this article is to explain what the exchange rate is, why it is important, how the exchange rate is determined and the economic impact of a depreciation. The rate at which a currency of one country exchanges for a currency of another country is called the “exchange rate”. The exchange rate can either be expressed in terms of number of units of domestic currency per unit of foreign currency (direct quotation) as in the case of most currencies such as the Sri Lankan rupee, or the number of units of foreign currency per unit of domestic currency (indirect quotation) as in the case of some major trading currencies such as the pound sterling and the Australian dollar. When the value of the domestic currency increases in terms of another currency, it is referred to as a nominal appreciation of the domestic currency. In contrast, a decrease in the value of the domestic currency in terms of a foreign currency is known as a nominal depreciation. The exchange rate plays a pivotal role in any economy. The exchange rate is important for trade and investment. 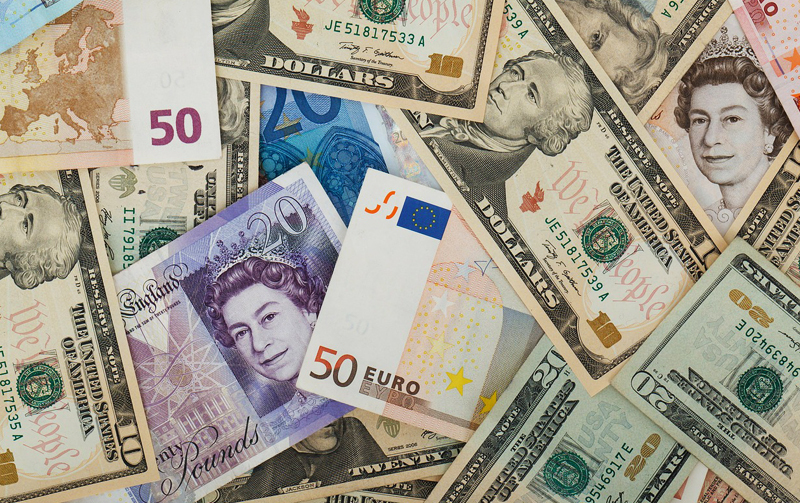 The exchange rate affects the price of imports when expressed in domestic currency and the price of exports when converted into foreign currency. Therefore, the exchange rate can have an impact on a country’s inflation and serves as an indicator of external competitiveness and hence of likely developments in the Balance of Payments (BOP). The exchange rate also occupies a central position in monetary policy where it may serve as a target, an instrument or an indicator-depending on the monetary policy framework adopted. Therefore, central banks or monetary authorities are given the responsibility in deciding appropriate foreign exchange policies for their countries along with the monetary and financial policy frameworks. Usually, the supply of and demand for foreign exchange in the domestic foreign exchange market determine the external value of the domestic currency, or in other words, a country’s exchange rate. Demand for foreign exchange arises from payments required for imports of goods and services and for capital payments such as debt service payments, whereas supply of foreign exchange is determined by earnings from export of goods and services and remittances as well as from receipts related to the financial account such as foreign investment and foreign loan inflow. As such, the demand for and supply of a currency in the foreign exchange market rest on real forces determining a country’s imports, exports, workers’ remittances, foreign investments and other financial flows. Countries in the world operate under different exchange rate regimes. An exchange rate regime is the process by which a country manages its currency in respect to foreign currencies. There are two major types of exchange rate regimes at the extreme ends; namely the floating exchange rate regime, where the market freely determines the movements of the exchange rate, and the fixed exchange rate regime, which ties the value of one currency to another currency. Although countries generally maintain its exchange rate at a stable level in relation to currencies such as the US dollar or the euro under a fixed exchange rate policy, since the exchange rate of currencies such as the US dollar and the euro are determined in the market freely, even under a fixed exchange rate policy the exchange rate of these countries would be determined according to movements of major currencies in global markets. There is also a spectrum of intermediate exchange rate regimes that lie in between these two extremes, and are referred to as BBC rules-Baskets, Bands and Crawls. These include pegged float, crawling bands, crawling pegs and pegged with horizontal bands. Basically, the free floating or flexible exchange rate regime is said to be efficient and highly transparent as the exchange rate is free to fluctuate in response to the supply of and demand for foreign exchange in the market and clears the imbalances in the foreign exchange market without any control of the central bank or the monetary authority. As there is no obligation or necessity for intervention, the central bank is not required to maintain a large pool of international reserves. In contrast, in the fixed or managed floating (where the market forces are allowed to determine the exchange rate within a band) exchange rate regimes, the central bank is required to stand ready to intervene in the foreign exchange market and, thus to maintain an adequate amount of reserves to use at such instances. Sri Lanka’s exchange rate policy has gradually evolved from a fixed exchange rate regime in 1948 to an independently floating regime by 2001. Sri Lanka, which followed a managed floating exchange rate regime with crawling bands since 1977, shifted to an independently floating exchange rate regime in January 2001 due to the strong need of maintaining a large stock of international reserves. With this move, the Central Bank of Sri Lanka stopped buying or selling of foreign exchange at preannounced rates, but reserved the right to intervene in the market to buy and sell foreign exchange at or near market prices, as and when it deemed necessary, depending on the movements of the exchange rate. Volatility in the exchange rate is caused primarily by unstable trade and financial flows such as foreign investments as well as by expectations. As central banks also have control over the money supply and interest rates, they sometimes intervene even in freely floating foreign exchange markets by filling in shortfalls in supply and demand, which could otherwise create excessive fluctuations in the exchange rates. Central banks do so using their own stocks of foreign exchange reserves or by influencing interest rates through money market operations. The aim of intervention in a managed floating exchange rate regime is to prevent excessive volatility in the short-term and to build up the country’s international reserve position in the medium-term. As Sri Lanka currently follows a flexible exchange rate regime, the exchange rate of the country is determined by the supply and demand for foreign exchange in the economy. The supply of foreign exchange depends on the inflows to the economy such as export proceeds, workers’ remittances, tourist earnings, direct investment flows and foreign loans while the demand for the same depends on outflows such as import payments and loan repayments. In Sri Lanka, foreign exchange earnings have persistently remained at a lower level than the demand for the same. Accordingly, a current account deficit has been a salient feature of the Sri Lankan economy. The deficit in the current account of the balance of payments of the country would have to be met through foreign exchange inflows to the financial account. If the deficit of the current account cannot be met through financial flows, then the exchange rate is to be depreciated as the exchange rate is expected to be an automatic adjuster under the flexible exchange rate regime. If the exchange rate is maintained at a stable rate, then a depletion of reserves would have to take place. In addition to domestic factors, global factors such as the global demand for exports, interest rates in international financial markets and currency movements also affect the external value of the domestic currency. In particular, the recovery in the US economy and the hike in interest rates by the Federal Reserve Bank have strengthened the US dollar against other major currencies in the international market. After three weeks of Donald Trump’s victory, the US dollar was 40 per cent higher against a basket of currencies of other major countries, from its lows in 2011. The reciprocal impact of this appreciation should be a depreciation of other currencies against the US dollar. Therefore, maintaining a stable exchange rate against the US dollar cannot be considered as a sustainable approach since this would lead to an overvaluation of the Sri Lankan rupee which would in turn reduce the competitiveness of our exports. At the same time, Sri Lanka does not have the capacity to intervene on a continuous basis through the supply of foreign currency due to the fact that the country has only a limited amount of international reserves which have largely been raised through debt creating sources. Using reserves accumulated through borrowed funds to defend the exchange rate is even more costly for the economy. Is exchange rate depreciation always bad? Allowing the exchange rate to depreciate is not necessarily a bad approach in economic management. However, popular belief is that a depreciation of the Sri Lankan rupee against other foreign currencies would only increase the outstanding stock of foreign debt, debt service payments and prices of imported goods and services. Nonetheless, a depreciation of the exchange rate can also have a positive impact on the economy. Depreciation of the exchange rate has a positive impact on the country’s trade deficit as it makes imports more expensive for domestic consumers and exports cheaper for foreigners. Such a policy would encourage domestic consumers to consume domestically produced alternative goods. More importantly, depreciation of the exchange rate would improve export competitiveness of the country as the depreciated exchange rate would lower the cost of goods exported from that country to the rest of the world. The combined effect of an exchange rate depreciation on imports and exports would boost domestic demand for alternative domestically produced goods and foreign demand for our exports, thus favourably contributing to enhancing exports, employment and economic growth in the country. An exchange rate depreciation can also impact government operations in the areas of revenue, expenditure, government borrowings in foreign currency, debt service payments and outstanding government debt. Depreciation would enhance revenues from import related taxes, especially if the country imports more of essential goods. Further, depreciation of the exchange rate would result in a higher amount of local currency for a given amount of foreign currency borrowings of the government. Despite such positive effects, depreciation of the exchange rate could also have some negative effects, especially in terms of increase in foreign currency debt service payments of the government and increase in expenditure on the imports including capital goods which are crucial for the long term growth of the country. In addition, depreciation of the external value of the domestic currency would lead to an increase in the domestic currency value of the outstanding stock of external debt of the country. However, even if the domestic currency value of the outstanding stock of external debt increases, the country will only have to service a certain portion of that debt stock in a year. Further, if loans are obtained in foreign currency, these loans and their interest component can be settled only if incomes are received in foreign currency or if additional loans are obtained in foreign currency. Even though the value of the rupee in terms of the foreign currency changes by any amount, the foreign currency equivalent of loans and the interest to be repaid would not change. Therefore, comments that the external debt burden of the government has increased significantly due to the depreciation of the rupee are misinterpretation of facts. The comments that if such a depreciation of the rupee did not arise, the government could have saved billions and this money could have been used for other mega development projects are not correct. If the exchange rate is overvalued/appreciated especially for a country like Sri Lanka, which continues to record a budget deficit and imposes significant tariffs on foreign trade, the budget deficit would further expand and this would necessitate to borrow more from domestic and external sources to finance the budget deficit. As such, though the net effect is difficult to be evaluated accurately, it is important to understand that depreciation of the rupee has not only negative implications, but also positive implications on the Sri Lankan economy. The positive effects of the depreciation of the exchange rate would contribute in reducing the impact of negative effects of the depreciation, but sometimes, the negative effects can be exceeded by the positive effects. As such, the most important message is that the negative effect of allowing the exchange rate to depreciate is not that significant compared to negative consequences of maintaining an overvalued exchange rate and shocks to the economy if the Central Bank suddenly moves out of the foreign exchange market after maintaining the external value of the rupee stable for an extended period. Sri Lanka has had numerous such experiences with the most recent events been in 2011/2012 and 2015. Total supply of foreign exchange to the market by the Central Bank amounted to US dollars 3,184 million during 2011, and US dollars 977 million during the first two months of 2012, until greater flexibility was allowed in the determination of the exchange rate in February 2012. In spite of this considerable loss of reserves, the Sri Lankan rupee depreciated from Rs. 113.90 at end 2011 to Rs. 132.55 against the US dollar by 26 April 2012, a depreciation of 14.07 per cent. Similarly, in 2015, the Central Bank supplied US dollars 1.9 billion in net terms during the year before deciding to allow more flexibility in the determination of the exchange rate on 3 September 2015, which was followed by a depreciation of 4.8 per cent against the US dollar by end September. In this context, the most prudent policy stance would be to allow the exchange rate to be determined flexibly, according to supply and demand conditions for foreign exchange in the market. Accordingly, this would ease the pressure on the exchange rate. However, as the Central Bank has intervened in the domestic foreign exchange market to prevent a sharp volatility of the Sri Lankan rupee, any decision to move away from this policy would lead to a sharp depreciation immediately before stabilising thereafter. Further, allowing the exchange rate to be determined according to market forces would not necessarily lead to a continuous depreciation of the rupee. The exchange rate could also appreciate if the country receives a substantial amount of foreign currency inflows. This could help the country to build up international reserves in the medium to long term. The most sustainable inflows in this regard would be earnings from exports of goods and services as well as long term foreign inflows such as foreign direct investments. Some countries in the Asian region, which lagged behind Sri Lanka a decade ago, are now growing at a faster rate benefitting from higher export earnings and/or inflows of export oriented foreign direct investments. Accordingly, maintaining a competitive exchange rate aimed at promoting Sri Lankan exports in the international market and attracting foreign direct investment to Sri Lanka, will remain vital in promoting the country as a globally competitive export-led economy.